In a study published by The Annals of Dermatology, chia oil was clinically proven to significantly increase skin hydration, reduce trans-epidermal water loss and increase skin barrier function. As we age, the barrier of the skin’s outer layer (the epidermis) becomes compromised due to thinning, weakening cells, making it harder for skin to repair itself. 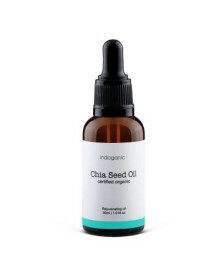 Topical omega-3 and omega-6 fatty acids, which chia oil has plenty of, actually help strengthen the epidermis. 3. May have anti-aging properties. Not only can chia oil potentially help skin stay strong over the years, it may also have additional anti-aging benefits. Chia oil’s high levels of omega-3s help build collagen—a key for supporting skin structure and maintaining youthful-looking skin. Omega-3 is not only an anti-aging property, it’s anti-inflammatory, too, making chia oil a great remedy for irritated and inflamed skin. 5. Less greasy than other oils. Norwitz says that chia is on the lighter side, as far as oils go. “While other oils may feel greasy and take a while to absorb, chia is ultra light and rapidly absorbs into the skin.” So, if you’re tired argan oil and find it too thick—or you’re still not so sure about putting oil on your oily skin—give chia a spin.